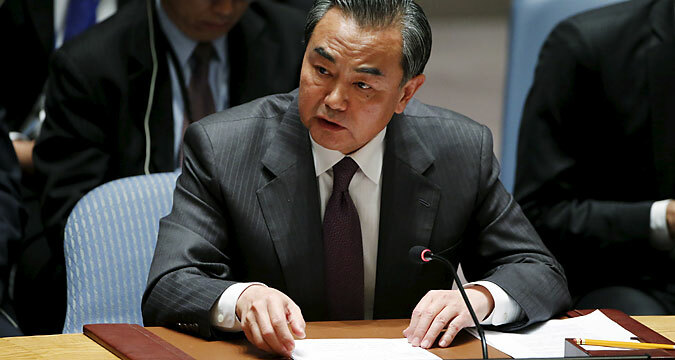 China's Foreign Minister Wang Yi speaks to members of the Security Council at the United Nations Headquarters in Manhattan, New York, December 18, 2015. RBTH presents a selection of views from leading Russian media on international events, featuring reports on Chinese plans to hold talks with representatives of Syria’s government and opposition, forecasts of continued low commodity prices for 2016, and analysis of the existential crisis facing the EU by State Duma speaker Sergei Naryshkin. The Chinese authorities intend to invite representatives of the Syrian government and the opposition to come to China for talks, the business daily Kommersant reports. “During the third ministerial meeting on Syria in New York, Chinese Foreign Minister Wang Yi announced that Beijing would invite representatives of the Syrian government and the opposition to come to China with a view to moving forward the political settlement of the crisis in Syria,” Chinese Foreign Ministry official spokesman Hong Lei said on Dec. 21. Asked when this visit may take place, he stressed: “We shall invite representatives of the Syrian government and the opposition in the near future.” Hong Lei did not disclose any further details. In 2015, commodity prices continued to fall, hitting thresholds of many years ago, reports news website Gazeta.ru. Since the start of the year, the Bloomberg Commodity Index has lost 27 percent, the worst drop since 2008. The commodities market is oversaturated. There has been a surplus of production for almost all commodities. Since the start of the year, oil prices have dropped by 35 percent and natural gas by 34 percent. The decrease in construction and steel production in China has resulted in falling prices for coking coal as well nonferrous, precious and ferrous metals. According to a forecast by China’s Metallurgical Industry Planning and Research Institute, consumption of iron ore raw materials in the country will fall by 4.2 percent in 2016. At the same time, most mining companies so far have no plans to cut production. The inevitable surplus of iron ore may result in a further drop in prices. Moody's rating agency has said that commodity prices will remain weak for several more years. “Commodities are still out of favor among financial investors. They probably are of the opinion that they can earn more money in other asset classes,” Daniel Briesemann, a commodities analyst at Commerzbank AG, told The Wall Street Journal. The European Union is bursting at the seams, generating a number of negative trends. Problems experienced by the Schengen zone; election outcomes in Greece, France, Poland, where the victory went to political forces focused on national interests; as well as referenda at which countries refuse to delegate their sovereign rights to the EU, all this shows that the European authorities have made a number of strategic mistakes. One of these mistakes is the approach the EU has adopted in relation to Russia, writes State Duma speaker Sergei Naryshkin in an article for the Izvestiya daily broadsheet. “Having come up against new challenges, it has shown itself to be ineffective, while Euro-bureaucracy has revealed how helpless and clumsy it is when faced with the migrant crisis and the rising terrorist threat,” he said. However, Naryshkin continued, this is just an effect, while the cause of the problems experienced by united Europe lies far deeper, and earlier accumulated mistakes are becoming increasingly more felt. “The threat that the European Union may break up is quite real. No one can say whether the EU will still exist in this form in five or 10 years,” Naryshkin quotes European Parliament speaker Martin Schulz as saying. It is high time Europe considered which direction it should take, writes the publication. Should it continue to further complicate its relations with Russia or become real partners? Should it continue to pursue a course imposed on it from the outside? All these questions become ever more acute now when “various countries are considering quitting the European Union, and there are refugees with a different history and culture amassing at its borders.” Perhaps now is the time to make use of the platform of the Council of Europe, which Russia joined 20 years ago? This anniversary could be a good prompt to start building new relations of comradeship, said Naryshkin.